There’s nothing SWAN-ish about March Madness anymore. But when it comes to REITs, don’t worry… we’re still shooting swishers. When you think about it, investing has a lot to do with roulette, because it teaches you the power of diversification. I’ll purposely revisit this article a year from now to see how the Elite 8 REITs have performed, and possibly there’s a Cinderella story unfolding. After a first weekend that lacked the madness we’ve come to expect in the NCAA tournament – leading to one of the chalkiest Sweet 16s in recent memory – this weekend’s Elite Eight surely made up for it. All four showdowns went down to the wire, with two reaching overtime, every game featuring double-digit lead changes and all of the losses separated by a combined seven points. The results led to two Final Four first-timers in Texas Tech and Auburn, and only one No. 1 seed – the one counted out the most, in fact – in Virginia, while No. 2 seed Michigan State upset the tourney’s top overall seed in a Zion Williamson-led Duke team that was the favorite to win the national championship. It was impressive watching how Michigan State kept up with the heavy favorite, dogging its steps and mimicking its score until that very last second. Then, when everything was on the line, the Spartans pulled out all the stops to finish the night up one. That’s one. Single. Point. A 68 to 67 final score. If winning is winning, then we have to acknowledge the opposite as well: That losing is losing. 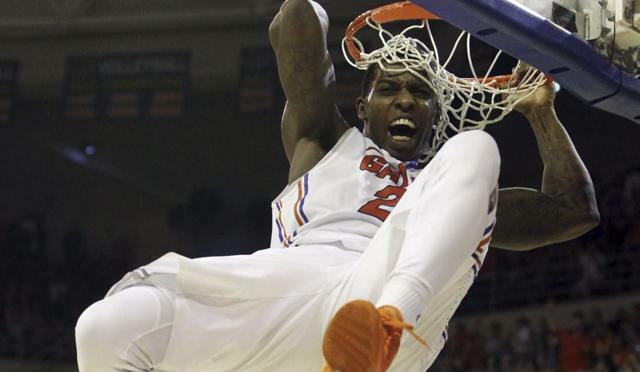 So let’s face the facts… A lot of college basketball brackets got blown to smithereens over the weekend. Sorry if yours was one of them. On the flip side, if by any chance you managed to foresee March Madness this far, give me a call. We should talk. Not that predictions mean much after so many never-saw-‘em-coming results, but the experts are saying that, right now, the championship trophy is completely up in the air. Will Auburn beat Virginia this Saturday? Will Texas Tech beat Michigan State? Bing, at least, is giving Virginia a 53% chance of winning – which essentially means its analysts have no idea. And they’re only slightly more confident when it comes to the evening game, saying that there’s a 56% chance Michigan will go on to the finals. Really though, this is anyone’s game. The Cavaliers are all about pace, using a pack-line defense that leads the nation in opponents’ points allowed (55) and slowing the game down in an ever-patient offense that often looks like a game of hot potato. While most teams get sped up when the shot clock is winding down, that’s when Virginia is at its finest, feeding the post with just enough time or using high pick-and-rolls for penetration to get the guards a high percentage shot. So will they? Or will Virginia play “at its finest” to advance yet again? In a separate article on the same site, Gleeson goes on to comment about how Michigan State is still fired up about beating such a favorite as Duke. “It was a confidence builder for a veteran group” with a “veteran mojo to make key plays down the stretch” – a valid point. Again, there’s little to conclude right now except that we’ll just have to see how things turn out over the next seven days. But there's that other competition we’re following that has some much more definitive conclusions to reach. There’s nothing SWAN-ish about March Madness anymore. So forget sleeping well at night in that regard. Since I’m on the edge of my seat there too, I can’t give you any relief on that one. 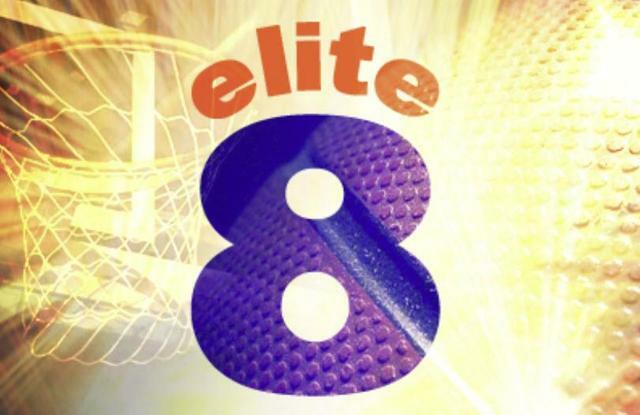 I’m happy to say that the elite eight picks below make it look easy. Better yet, there’s very little chance of any upsets coming their way. They’re solid. They’ve been solid. And they’re set to stay solid as far as my careful research can tell. Even though they’re out there on the REIT court, playing hard with your money, you’ve got it made. After you invest in these property plays, you should have a lot more breathing room to kick back and watch March Madness – while they do all the work. 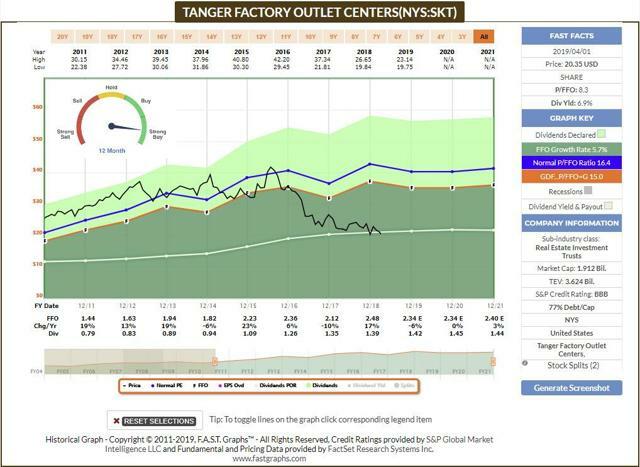 Tanger Factory Outlet Centers, Inc. (SKT) is a mall REIT that owns a portfolio of 44 outlet centers with 15.3 million square feet of gross leasable area in the U.S. and Canada. The company focuses on tenanting its space to brand-name retailers: Food and services are an afterthought. The success of Tanger’s centers has a lot to do with branding it has done over 26 years, establishing the name “TangerOutlets®” as a source of popular labels at bargain prices. Although Tanger was recently downgraded by S&P to BBB from BBB+, the company has sufficient free cash flow in 2019 to reduce debt. The dividend is well covered, and has increased annually for 26 years (even in 2007-2008), so investors can get paid to wait for Tanger to re-tenant its centers with retailers that thrive in an omnichannel environment. Since free cash flow is likely to remain in excess of $100 million/year, the balance sheet is conservatively levered, giving the company the financial strength to weather rent roll-downs and store closures for the next one to two years or until the tenant mix is optimized. But the proof already is baked in (so to speak) as Tanger has the lowest payout ratio in the mall REIT sector… and doesn’t have to worry about utilizing excess cash flow (or FAD) to fund high capex redevelopment like traditional mall REITs. That payout ratio is actually part of the secret sauce for Tanger - and we believe ultimately that Tanger will deliver strong returns (see my in-depth article on Tanger, this week). Our Strong Buy recommendation stands. Simon Property (SPG) is a best-in-class mall REIT, now in its 26th year as a public company, owning full or partial stakes in 235 Class A malls in North America, Europe, and Asia - totaling more than 190 million square feet of retail space. Just under 50% of the REIT’s net operating income comes from traditional U.S. malls, highly diversified, and nearly all located in dense, thriving, affluent cities - mostly in Florida, California and Texas. Forty-two percent of NOI is from its value platform - Premium Outlets and Mills locations: 10% is from international properties - providing U.S. investors with safe foreign diversification. Simon’s cost of capital is just 3.5% (courtesy of one of just two “A” credit ratings), which allows it to borrow massive amounts of money at very low interest rates. In addition, the company has access to revolving credit facilities with more than $7 billion in remaining liquidity - in case it wants to tap short-term credit markets to fund its growth. And not that Simon’s in any need, generating $1.35 billion in annual retail adjusted funds from operations (operating cash flow minus maintenance costs). Core fundamentals are what long-term income investors track to know the health of the business, and all are excellent: For 2018, Simon’s FFO per diluted share was $12.13, an increase of 8.2% year-over-year, at the high end of their peer group. Fourth quarter FFO was $1.15 billion or $3.23 per share, an increase of 3.5% year-over-year. More widely, the four-year per share FFO has grown at a compounded 8% annually. 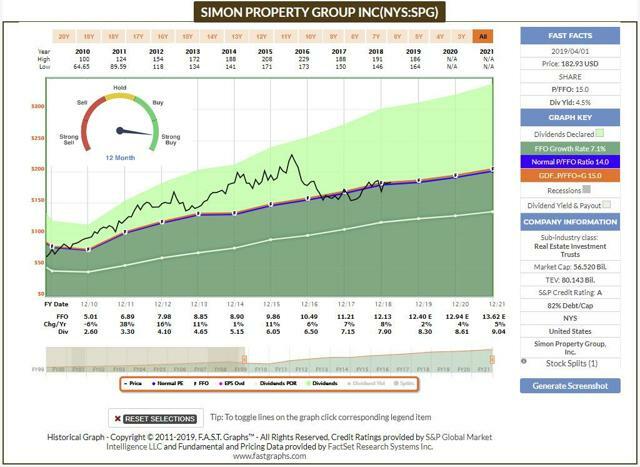 Showing Simon’s stellar growth, 1994 FFO was $165 million in their first full year as a REIT - in 2018, $4.3 billion. As for NOI, the full year saw an increase of 2.3%... and 2.1% for the fourth quarter. Q4 2018 average sales per square foot was a record $661, compared to $628 in the prior year period - an increase of 5.3%. Mall and premium outlet occupancy ended the quarter at 95.9%, up 40 basis points from Q3, and 30 basis points more than the prior year period. It’s easy to see Simon’s strong business approach produces results - given their commitment to strategy, active portfolio management, disciplined investment, relentless focus on operations, and cost structure. And with the current market pricing, SPG’s clearly a strong buy. 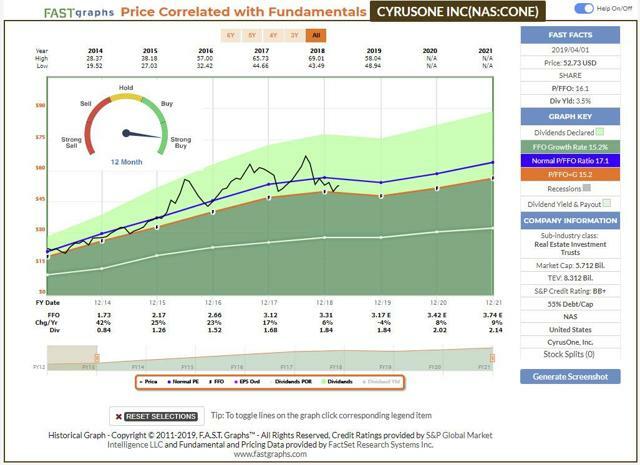 CyrusOne (CONE) has set the stage for growth in 2020 and beyond, with outsized potential to generate returns in the double digits. CONE is a high-growth data center REIT specializing in highly reliable, enterprise-class, carrier-neutral data center properties in more than 45 locations mission-critical facilities worldwide that protect and ensure continued IT infrastructure operation for approximately 1,000 customers - including over 210 of the Fortune 1000. Their strong balance sheet is helped by S&P’s credit upgrade (last September), giving the company significant financial flexibility and capacity to fund growth: With no near-term debt maturities, debt fully unsecured, and liquidity of approximately $1.6 billion. CONE’s 2018 was a record leasing year, with the portfolio increasing 30%, signing 103 megawatts, or $153 million, in annualized GAAP revenue - up nearly 50% from 2017. The backlog at the end of 2018 totaled $54 million (equivalent to the entire size of CyrusOne at the 2013 IPO). In Q4-18, normalized FFO (funds from operations) of 86 cents per share beat the estimate of 82 cents, while revenue of $221.3 million missed the consensus $223.5 million. This year’s guidance lowers normalized FFO per share ($3.10-$3.20) vs. $3.31 achieved during 2018. The $20 million in annualized revenue signed during Q4-18 was nearly 15% higher than prior year period bookings. Admittedly, there are always “growing pains” to be expected - that’s what happens when you’re building out a global footprint and targeting the largest data center markets in Europe. For 2019, CyrusOne expects to invest $400 million of the capex budget into EU and U.K. projects, so the company can become competitive with other powerhouse data players such as Digital Realty (DLR) and Equinix (EQIX). While disconcerting to see the company isn’t planning a dividend increase in 2019, we’re taking the opportunity now to purchase more shares more cheaply, recognizing that our “Strong Buy” thesis on this transformative data center REIT will eventually play out to our advantage. 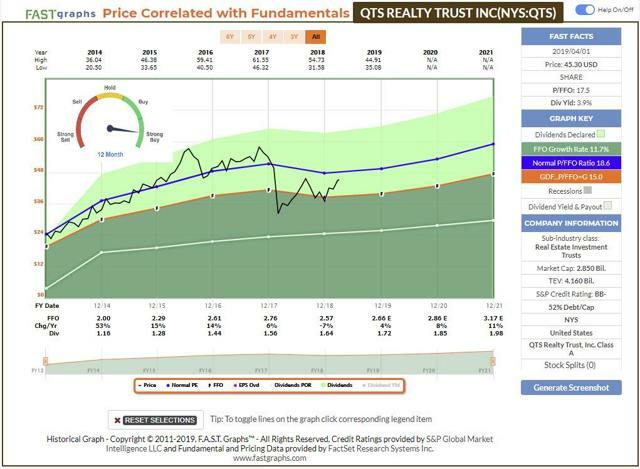 QTS Realty (QTS) is the smallest of the publicly traded data center REITs (as measured by market cap). It’s also the most enigmatic, likely most misunderstood of the group, largely due to the February 2018 management announcement pivoting away from its non-core cloud and managed services to focus on hyperscale (public cloud service, software, content, social media giants), and enterprise hybrid IT colocation. Analysts and investors initially felt blindsided and confused - and QTS shares were hammered. Today, the company is much “cleaner” with a valuation compelling for a private equity purchaser, or data center consolidator – including Digital Realty (DLR) or Equinix (EQIX). Last year’s low FFO multiple for QTS common shares required creative ways to raise cash for new development projects. This included issuing preferred shares in 2018, and most recently, announcing of a 50/50 JV valued at $240 million with global infrastructure fund Alinda Capital Partners, for a 24MW property in Manassas, VA - a data center asset reportedly build-to-suit for Salesforce.com (NYSE:CRM). Colleague Bill Stoller, who contributed to this assessment, agreed there were a lot of moving parts in the recent quarterly earnings, making it difficult to predict just how 2019 will play out for this data center REIT "Swan-a-Bee." And, yes, though not “full-fledged,” I’ve included them in these “Elite 8 Swans." “In Q4-18, adjusted EBITDA margin increased 580 bps, as did operating FFO per share by 6% year-over-year. And the board raised the quarterly distribution by 7.3%. But recently, with the usual surprise, QTS announced a 6.75 million secondary share offering - without much guidance on timing and use of funds. QTS shares fell, nor did their Q4 presentation slides show the timing of lease commencements for the $63 million booked-not-billed backlog. My bottom line: Shareholders can expect mid single-digit dividend increases going forward and plenty of room for price appreciation through multiple expansion for QTS shares… if management continues to deliver solid bookings and adjusted EBITDA margins. It might be a close call, but I’m confident calling it a strong buy. 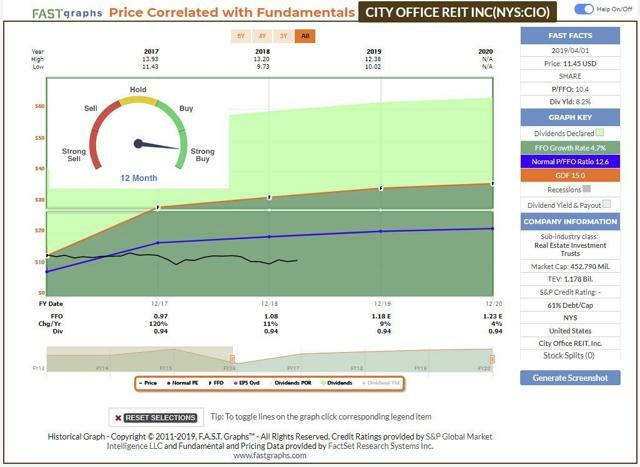 City Office (CIO) is an office REIT that focuses on secondary markets, acquiring assets at attractive yields in targeted markets, while selectively executing value-add initiatives to drive returns. In Q4-18, the company acquired four properties for $156 million (second-tier city with higher-than average urban population growth and lower cost of doing business). CIO targets a mix of Grade A and B properties that allow it to enjoy average cap rates of 7.3% and that it can refurbish and boost occupancy (and rents) over time. The key to this long-term value investing strategy is being located in cities with faster population and economic growth as well as slower new office construction (to minimize the risk of oversupply). CIO has been able to locate more profitable growth opportunities and believes that in the future it will be able to achieve about 7.5% cap rates, which will be a big AFFO per share growth driver, as will the fact that some of its properties have average rents up to 20% below market levels. Like most new small-cap REITs, CIO has had to grow into its dividend (in terms of payout ratio), which management has been focused on since 2015. CIO’s valuation is attractive – hence our strong buy - as shares trade at 9.7x 2019E FFO/share, compared to the broader office REIT sector at 18x. The portfolio occupancy is around 92%, with upward pressure as the leasing pipeline is healthy, particularly for value-add projects, while just 6% of rents are scheduled to expire over the next 12 months. Also, the debt profile is sound, as there's roughly six years average maturity, more than three-quarters of the debt is fixed, mortgages are with a mix of lenders, and seven assets are unencumbered. 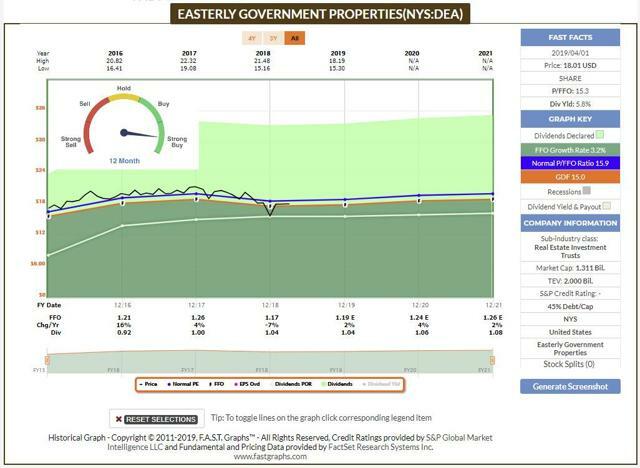 Easterly Government (DEA) is an office REIT that focuses on federal government buildings. DEA is the only "pure play" government-leased model with internal management and the company owns 65 properties encompassing 5.6 million square feet, including 31 properties leased primarily to U.S. government tenant agencies. The pool of assets that Easterly owns is fragmented - the five largest owners of GSA-leased assets own 16.0% in the aggregate, with no single landlord owning more than 3.9%. Easterly sticks to critical missions of the federal government that don't go out of favor - agencies such as the Federal Bureau of Investigation and Immigration and Customs Enforcement. DEA’s debt profile is sound the company has (as of Q4-18) debt of $791 million, consisting of $155 million outstanding on the unsecured revolving credit facility, $150 million outstanding on the 2018 term loan facility, $100 million outstanding on the 2016 term loan facility, $175 million of senior unsecured notes, and $211 million of mortgage debt. Availability on its revolving line of credit is $315 million and the company’s net debt to total enterprise value is 36.2% and its net debt to annualized 4Q EBITDA ratio is 6.2x. 2018 was a year of significant growth for Easterly. In 2018, the company successfully closed on 15 properties, 11 of which came from the 14-property portfolio, accretively growing the portfolio by nearly 40%, “while maintaining true to the bull’s-eye acquisition strategy” (quote from Easterly’s CEO). Up until December 2017, DEA was growing its dividend, modestly, but the company opted to freeze the growth in 2018 (maintaining the annual payout of $1.04 per share). This was likely due to the elevated payout ratio, in excess of 100% based on AFFO. However, we are forecasting that the company will begin growing the dividend again in 2020. Obviously the elevated payout suggests DEA has a higher risk profile, but the government-backed leases provide us with SWAN assurance that the revenue is stable and predictable, and that’s one of the reasons we include this REIT as a strong buy. Outfront Media (OUT) is one of the largest out-of-home media companies in North America with a portfolio of around 500,000 digital and static displays, which are primarily located in the most iconic and high-traffic locations throughout the 25 largest markets in the U.S. The company went public (the IPO) on March 28, 2014, and began operating as a REIT on July 17, 2014. Bulletins (or billboards) offer the most powerful impact of all outdoor advertising formats. Located on key highways, intersections and integral choke points throughout the U.S., bulletins provide messaging with long-term presence and tremendous visibility to vehicular traffic. In 2018, OUT’s year-over-year AFFO grew by 18.4%, mostly driven by the higher OIBDA. The strong Q4 2019 performance helped AFFO increase 8% for the year which put the company well ahead of its original low to mid-single-digit guidance for the year. In 2019, OUT expects AFFO to grow in the mid-single-digit range, as the payout ratios on AFFO for the quarter on a last 12-month basis were comfortably in-line with historical ranges. 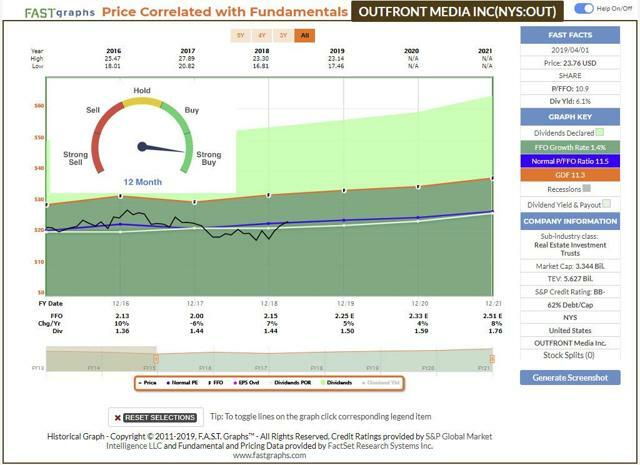 OUT is trading at 10.5 P/FFO, and the dividend has ample coverage ($1.50/$2.25 or 67% based on AFFO), and projected to grow in the range of 5% in 2019 and 2020. We see no “slowdown” ahead and that's one of the primary reasons we are maintaining our strong buy on OUT – we forecast 27% annualized returns over the upcoming 12 months. Monmouth Real Estate (MNR) is an industrial REIT that operates a property portfolio that consists of 113 industrial properties, representing approximately 21.8 million square feet. The geographically diversified portfolio is from coast to coast across 30 states with a focus on major seaports, major intermodal ports, and major airports. MNR’s exposure with FedEx is highly concentrated, with over 59.6% of annual rent and 48% of square footage leased to the logistical giant (MNR leases from FedEx Ground, FedEx Express, and FedEx Supply Chain Services - all unique operating subsidiaries that enjoy the parent S&P rating of BBB). MNR also has substantial exposure to the East Coast - and that's another important characteristic, as the company recently acquired two brand-new Class A built to suit properties, both leased to Fedex Ground, in Trenton, New Jersey, and Savanna, Georgia. MNR’s capital structure consists of approximately $898 million in debt, of which $772 million is property level (secured) fixed rate mortgage debt and $126 million in loans payable. Around 86% of the debt is fixed rate with a weighted average interest rate of 4.1% (as compared to 4.2% in the prior year period). The weighted average debt maturity for fixed rate debt was 11.8 years at quarter end, compared to 11.5 years in the prior-year period. This represents one of the longest debt maturity schedules in the entire REIT sector. MNR also has $288 million outstanding on the Series 6 and 8 perpetual preferred equity at quarter end, so combined with an equity market capitalization of $1.1 billion, the total market capitalization is approximately $2.3 billion. 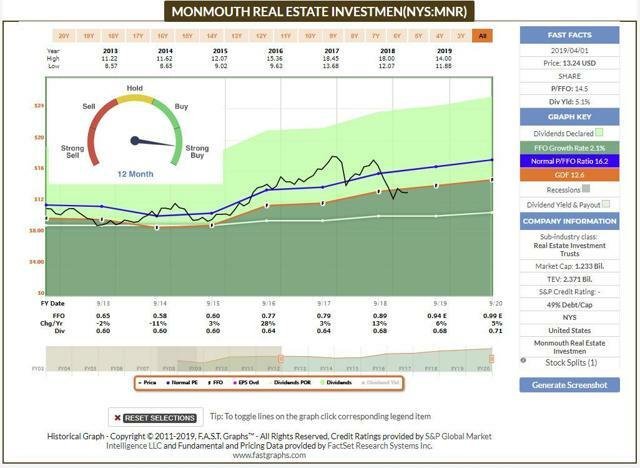 As noted in a recent article, we upgraded MNR from a hold to a strong buy based strictly on valuation. We have not been a fan of MNR’s REIT securities portfolio, but given the cheaper valuation (due in large part to FedEx), we opted to remove MNR from the penalty box. In Q1-FY19 (ending 12/31/18), MNR generated "record high" AFFO per share of $0.23 per share, up 4.5% year-over-year, that resulted in a conservative 74% AFFO dividend payout ratio. The company has done an excellent job of growing AFFO per share that has averaged ~14% since 2014. Our expectations suggest that MNR could generate considerable price appreciation as FedEx bounces back, and although we have our doubts regarding the REIT securities platform, we believe there’s an opportunity to capitalize on the discount being offered by Mr. Market. Not all of these “elite 8” REITs are SWANs, as defined by their overall quality rating. However, we believe that the best way for investors to sleep well at night is to purchase the shares with a cushion, or margin of safety, built in. In a few weeks I will be traveling to Las Vegas to attend three conferences (SALT, Money Show and ReCon) and this means that I will have plenty of time to write, research and of course play my favorite casino game, roulette. When you think about it, investing has a lot to do with roulette, because it teaches you the power of diversification. Recognizing that the house has a distinct advantage in roulette (that’s how gambling works), there are distinct similarities with investing (and roulette) in that you are setting the odds in your favor by diversifying. That’s my goal here on Seeking Alpha. I'm not always going to hit the magic number (i.e. Tanger), but I will provide you with the best opportunities in which to capitalize on mis-priced REITs that should ultimately provide you with superior performance over time. Oh yes, it takes time. Not just a few quarters. I’ll purposely revisit this article a year from now to see how the Elite 8 REITs have performed and possibly there’s a Cinderella story unfolding. Good luck to all! "Brad Thomas is one of the most read authors on Seeking Alpha, and he has developed a trusted brand in the REIT sector." Disclosure: I am/we are long CIO, SKT, SPG, DEA, CONE, QTS, OUT. I wrote this article myself, and it expresses my own opinions. I am not receiving compensation for it (other than from Seeking Alpha). I have no business relationship with any company whose stock is mentioned in this article.